If you’ve got painfully tight knees that restrict your movement, there may be something missing in the way you’re doing your quadricep stretches. Simply stretching the muscle is only one piece of the puzzle when it comes to improving your capacity for movement and preventing injury. In this article, we’re going to dive into the anatomy of the quadriceps, their role in exercise and everyday activity, and the only 3 quadricep stretches you’ll ever need to improve something I like to call range of control. The quadriceps are one of the strongest muscle groups in the human body and cover almost all of the anterior aspect of the femur. As the name suggests, the quadriceps, or quads are made up of four heads (quad means four). The rectus femoris originates at the pelvis, in the anterior inferior iliac spine and the acetabulum, and inserts into the base of the patella (knee cap). The rectus femoris plays a role in extension of the knee and is the only quadriceps muscle that causes flexion at the hip, making it one of a few 2-joint muscles in the body. The rec fem is shortest with hip flexion + knee extension and it’s at its longest during hip extension + knee flexion. The vastus medialis runs medially along the femur and connects with the other heads at the quadriceps tendon, then inserts at the base of the patella on the medial side. The vastus medialis, also known by its street name, the teardrop muscle, functions to extend the knee and stabilize the patella. The vastus lateralis originates at the greater trochanter (head of the femur) and the linea aspera (ridge of the femur). 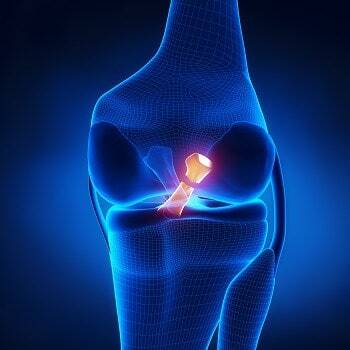 It then runs down the thigh laterally and inserts into the base of the patella on the lateral side. This is the largest of the four quadriceps muscles and plays a role in knee extension, knee stabilization and helps to absorb impact when walking, running and jumping. The vastus intermedius begins at the upper femur, deep to the rectus femoris, and joins up with the other muscles of the quadriceps inserting at the base of the patella. The function of the vastus intermedius is again primarily involved with extension of the knee. As the quadriceps are responsible for knee flexion, stabilization and to a lessor extent hip flexion, they are important for a number of exercises and everyday activities. During running, the quads extend the knee in both the early and late swing phases of the gait. Knee extension is first seen in the early swing phase, as the rear leg extends behind you and the foot comes off of the ground. Knee extension happens again later in the swing phase as the leg extends out in front of you to make initial contact with the ground before initiating the stance phase. The quadricep muscles then co-contract with the hamstrings, as the foot makes contact with the ground, to stabilize the knee and absorb the impact. Knee extension is also seen working together with hip extensor muscles to bring the body from a flexed squatting position to an erect standing position in exercises like the squat and deadlift. The quadriceps also stabilize the knee in stationary positions, like standing, to prevent the knee from buckling or giving way. If you’ve read my other blogs, you‘ll know that I rarely advise just static stretching. This is because strength is required to maintain control when your muscles are in a stretched position and if you have no strength, you have no control and when you have no control you’re susceptible to joint injury. That’s why if you want to improve the quality of your movement it’s important you improve your quadriceps flexibility and strength to increase your range of control (ROC). I’ve coined the term “range of control” because it implies that the entire range is under our conscious, muscular control, while range of motion does not have that same implication and you can have full ROM but if it’s only passive movement i.e. you can only get there with the help of gravity or a partner, it’s not useful. To keep our joints and all of the passive joint structures like ligaments, menisci and bursae healthy, our muscles need to be functioning properly to absorb as much of the forces generated through movement as possible, so these forces don’t have to be absorbed by the passive tissues. This is especially critical when you consider that passive tissues typically take months to years to heal when injured, whereas muscle injuries can heal in weeks to months. So, full ROC is crucial for movement LONGEVITY and keeping you moving as good now as you will 10 years from now, and it’s something we’re very interested in helping you maximize here at PMc. Exercises increasing your range of control are needed to train the quads, especially the vastus medialis, as it won’t be strengthened efficiently if it isn’t regularly lengthened. Now, how did that feel? If you could sit in that kneeling position comfortably, without pain and were able to breathe easily, congratulations, you’ve got sufficient ROM and the techniques we’re going to go through will help you maintain it and build your ROC. As mentioned above, it’s critical that you don’t just stretch the muscles passively, as you want to build strength as well as flexibility to improve range of movement. Below, I have provided you with the only three quadricep stretches you’ll ever need to improve flexibility and strength. In this stretch, you’re going to work activating both the agonist and antagonist muscles, being the rectus femoris and the hamstring respectively. Contracting and relaxing both the agonist and the antagonist muscles will help lengthen the rectus femoris and improve control of the hamstring at end of range position. The BJJ quadricep stretch is a great warm up for everyone that I first learned when training Brazilian Jiu Jitsu. If you’re not familiar with BJJ, it’s a martial art that focuses on grappling on the ground and demands a good level of flexibility and strength in the quads and hips. This is why it is such a great exercise for anyone needing to improve hip mobility and flexibility in the quadriceps, especially the rectus femoris and it works great as part of your dynamic mobility warmup. This stretch follows the same contract relax philosophy of the last exercise, in that it trains glute and hamstring activation at end range, while improving quadriceps strength and stability in a lengthened position. It’s always a good idea to check your improvements in flexibility and range of motion after you perform any routine. After you have finished doing these three quadriceps stretches, go back and do the kneeling test again. You should notice at least some change from the first attempt and that change will improve even more as you continue to perform this routine. There you have it, 3 quadricep stretches to improve flexibility, strength and range of motion. Now you know that the quadriceps are involved in so many functional movements, it’s important that you take care of them in the future to reduce the risk of injury and improve your capacity for movement.